This promises to be a memorable keynote. Kai is an incredible performer who has an equally compelling message that will inspire G2I attendees to bring their own unique ideas forward. 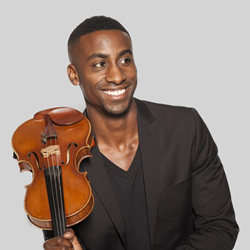 Uniquely talented musician Kai Knight, who embodies the power of innovation in a world of conformity, will deliver the closing keynote at the Gateway to Innovation (G2I) conference April 25, 2019 at America’s Center Convention Complex in downtown St. Louis. G2I is the region’s premier gathering of technology professionals and executives. Kight uses music as a metaphor to inspire individuals and organizations around the world to compose paths of imagination and fulfillment. Kight has performed his original music for audiences around the world, from the White House to the Great Wall of China. His mesmerizing and original violin performance beautifully becomes a sonic metaphor for the core of his message: to inspire people to compose unique ideas in a world that celebrates conformity. “This promises to be a memorable keynote. Kai is an incredible performer who has an equally compelling message that will inspire G2I attendees to bring their own unique ideas forward,” said 2019 Gateway to Innovation Conference Chair Jill Rausch of WWT Asynchrony Labs. Registration information for the 2019 conference is available on the G2I website here.